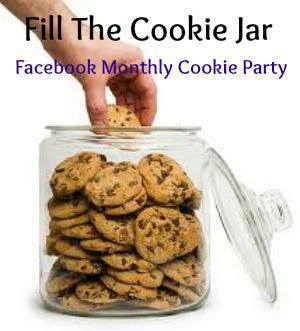 It's time to "Fill The Cookie Jar" and the theme is "Back to School". I had a great idea for a cookie for this month, but I have been so busy with the garden and keeping up with all the veggies, I kept putting off any and all baking. Believe me, Truckin' Man has been monitoring very closely the lack of cookies in the house. He is by no means going hungry, but sweets have been lacking. Especially cookies. On the rare occasion I have baked, I have made bars because well... they are faster. And, now that I think about it, the last bars I made were no-bake. Yikes. Well, by Tuesday evening, I had come to terms with the fact that I was going to miss my first ever "Fill the Cookie Jar" post. Then Wednesday morning, I get to work, and the first thing I hear from my co-worker is "Don't you bake anymore?" So... Here we are, for the sake of my cookie baking reputation, I am pulling out all the stops and clearing the veggies off the counter and baking cookies for all the guys. I sure hope they aren't disappointed! I LOVE this cookie, and will be sure to make it again. As is usual for my cookies, it's a soft cookie. The vanilla shines through, and reminds me why I love vanilla so much and always get a good quality vanilla. You certainly don't need to do this, but I wanted a little more cinnamon kiss on the cookie, so after "smooshing" the cookie, I sprinkled a bit more cinnamon sugar over top each one. In a large bowl, cream butter and 1/2 cup sugar until light and creamy. Add the egg, mixing well. Next, add the sour cream and vanilla, mixing until completely combined. In a medium bowl sift together flour, baking soda, baking powder, and salt. Add dry ingredients to butter mixture, mixing until flour is completely combined. Chill cookie dough in refrigerator for 1-2 hours. Preheat oven to 350 degrees and line baking sheets with parchment paper. In shallow bowl, combine 1/4 cup sugar, and cinnamon; stir until combined. Roll dough into 1", and place a couple inches apart on prepared baking sheet. Dip bottom of glass into water, then into cinnamon sugar mixture. Press glass onto each cookie to flatten. Bake for 8-10 minutes or until just turning golden. Cool on sheet for 3 minutes, then transfer to cooling rack. These sounds so good and I love cinnamon so these added cinnamon sugar would be great for me... and I would be able to eat them all as hubby is not too fond of cinnamon. Yum! This looks like a winner :) Back to school is Sept 2nd for us, I'll be sure to make a batch to greet my tired girls with! 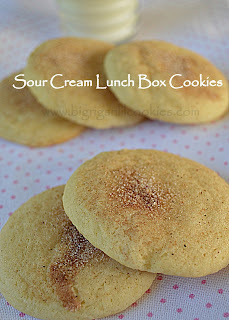 mmm..sour cream..these cookies look and sound GREAT! These cookies sound so soft and delicious! YUM! I love soft cookies. These look soooo good, Kris! Nothing like a warm, soft, vanilla, cinnamon kissed cookie right out of the oven! I've got to jump in on this group real soon!